Pancreatic tissue and cell types. 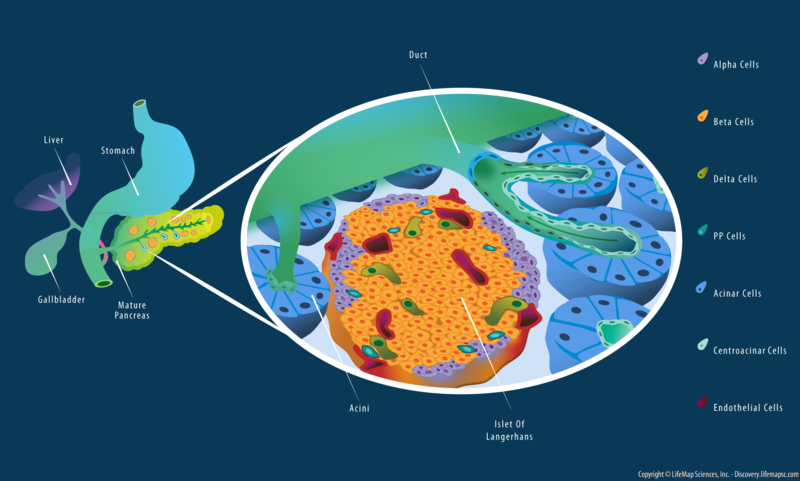 Illustration of the major cell types and their arrangement within the pancreatic tissue, as either endocrine islets of Langerhans or exocrine acini. The islands of Langerhans primarily contain alpha, beta, delta, epsilon and pancreatic polypeptide endocrine cell types, as well as vascular endothelial cells. The acini are composed of exocrine acinar cells, as well as centroacinar duct cells that are centrally located within the acini and drain into the pancreatic ducts.